After a week of either grilled meat or pasta, we escaped to Palermo Viejo for lunch and booked a table at Sudestada. Located on the corner of Guatemala and Fitzroy, the restaurant is a stark white space complemented with a few black touches. Opened in 1999, it has been a success from the beginning and has helped make this far-flung corner of Palermo Viejo a destination. Now, several other restaurants also occupy this area. Directly across the street on the other corner is Standard, an Argentine-style diner run by the same people who own Sudestada. There is also a recently-opened Sudestada in Madrid which I intend to try soon. We arrived at 1:00 p.m. and a few minutes after we did, the place stated to fill up. The menu is a collection of Southeast Asian dishes with wok-fried items being the main event along with a few things from the grill. Unfortunately, the grill items are off the lunch menu and can only be ordered at night and since I’ve been here several times before but always for lunch, I’ve never had the chance to try any of them. There is also a set lunch menu for 23 AR$ (about US$7) which includes a starter, a main course and a soft drink and is on a separate sheet of paper that comes with a hole punch so you can choose the items yourself by punching your selection on the piece of paper – a quirky design touch. We ordered some cha gio (Vietnamese spring rolls) to start while we decided on what we would all have for lunch. Since there were four of us, we opted for the set lunch for our five-year old: steamed dumplings plus a vegetable curry with rice. We opted to share three items from the Wok selection: bean thread noodles with shrimps, chicken and vegetables; stewed spicy pork-ribs and stir-fried spicy duck. The spring rolls were crispy and came with the traditional lettuce, cilantro and mint leaves to roll them in plus the fish sauce dip. There was also a tasty cabbage slaw that accompanied them which is not typical at all but good nevertheless. We waited a bit before the main courses arrived. 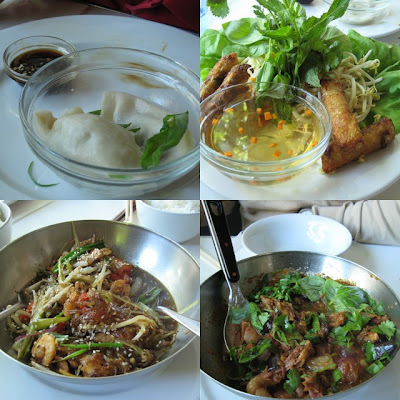 All were served in large metal bowls with steamed white rice on the side. The noodles were very good and came in a tamarind-flavored sauce with lots of chicken and shrimp. The duck was spicy but the heat was offset by the sweetness of the grapes. The pork ribs were falling off the bone and came with a tangy soupy sauce. The lunch set vegetable curry was good but not like a typical coconut based Thai curry but more of a Japanese curry made with these special curry cubes. At first, we thought we wouldn’t be able to eat everything, but slowly we worked our way through the different dishes and eventually finished it all. Order a Thai lemonade, like we did, to help tone down the spiciness. There were some tempting dessert items on the menu but I guess I can save that for my next visit. Maybe then I try to have dinner so I can finally sample the grill items and their desserts.